”Come to the edge,” He said. They said, ”We are afraid.” ”Come to the edge,” He said. They came. He pushed them… and they flew. The answer to this plain question should always be a resounding no: it never pays to give into panic. The smartest option is to derail this emotion before it gains any traction. Once fear takes over, the end is nigh. 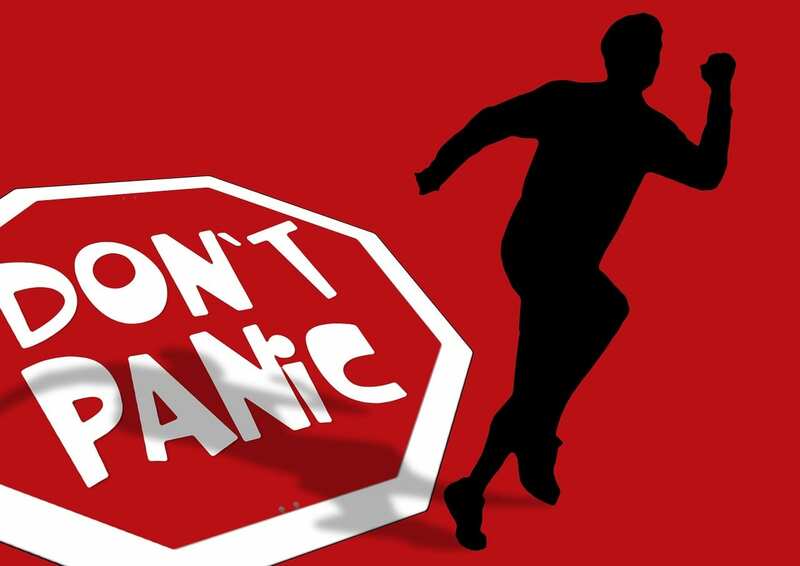 When the markets were disintegrating approximately two weeks ago and if you were one of the lucky few that opted against joining the bandwagon of panic, you should have had a feeling of déjà vu; sort of like the movie ground hogs day. The same-old twaddle that was broadcasted before was once again intoxicating the masses; like cockroaches, these naysayers emerge from the woodwork and hum the same-old hymn “the world is going to end” and or financial disaster is around the corner. In each instance, you will find that the same rubbish is spun in a different way; this is recycling at its best. What they so conveniently omit is how each and every single one of these so-called end of the world events proved to be nothing but a mouth-watering opportunity for the astute investor. Now we are not stating that caution should be thrown against the wind. What we are simply stating is that if you become one with the fear, then this useless emotion will take over and blind you from seeing any opportunity, even if it slaps you hard on the face. Never become one with fear; understand that when it comes to trading fear is on par with toilet paper. Let’s take a sombre look at what is actually going on, and why these events are unfolding. It’s more than obvious that the market was in a corrective phase or crashing if one joins the naysayer’s camp; the more appropriate term would be letting out steam that was long overdue. The last week of August was the worst week for equity markets since 2011. One could also point out that the markets have not experienced a significant pullback since 2011. China devalued its currency to boost exports; it had to; we are in the midst of a currency war, and most nations other than the U.S. are allowing their currencies to literally collapse. However, devaluing the currency affects sales and profits at many multinational companies, including those back in the U.S. So expect the U.S. to do something that has a negative impact on the dollar. The next issue is that the world’s second-largest economy is no longer growing as fast. Growth is slowing down and so far it appears the government’s response to address this has been ineffective. In the short term, this will continue to be the case, but over the long term, we think their policies will be conducive for the economy and stock market. Manufacturing activity is slowing down in China, and this has a big impact on the commodity markets. This is the primary reason many markets in this sector are experiencing severe corrections. Copper, oil, and iron to name a few have just fallen apart. The extreme plunge in energy prices while a relief for consumers, has unnerved investors. Though to be fair, a lot of this had to do with excess supplies. Demand is not keeping up with supplies, which is a clear indication that worldwide demand for oil is softening. Up until recently, the Fed’s decision to start raising rates was another factor weighing on the markets. That uncertainty is no longer an issue as the Fed has now signalled that it will not be raising rates. There is really no inflation problem to tackle. We are referring to the manufactured numbers that suggest all is well when the opposite holds true. This is what the masses believe and so this is what counts, as what they believe drives the markets. Energy prices are down significantly, and the raw materials sector is basically in a bear market. Wages are not rising; at best, they are stagnant. Over 50% of the components of the CPI (consumer price index) have declined in the past six months. TIPS are also signalling that for the foreseeable future, inflation is not going to be an issue. Under these circumstances, a rate hike would make no sense, and only further destabilize the markets. Let’s not forget the additional turmoil; a rate hike would cause in the currency markets. A rate hike would further strengthen the dollar, and adversely affect U.S. exports, making them less competitive in the global markets. Again, we do not necessarily agree with the low inflation scenario as rents are rising and the cost of many goods over the past several years have risen dramatically. What we believe in is not of importance, for, in the end, it’s the crowd that drives the market, up to a certain point. When emotions hit a boiling point, which they have not, then one can start taking a position that is opposite to that of the masses. Any expert who claims to know precisely what will occur should be ignored. Even a broken clock is correct twice a day. Hence, if an expert makes a large enough number for pronouncements, one of them is bound to come to pass. It does not mean that individuals cannot determine the direction of the markets. As we have stated many times before, there is a vast chasm that separates spotting market bottoming and topping action, with trying to identify the exact top or bottom. Investor confidence has taken a beating. Under these conditions, many investors will either sit on the sidelines or take some money out of the markets. This is good for it will drive stocks to even more attractive levels. The masses are well-known for their ability to buy and sell at precisely the wrong time. Traders are not overtly bullish. Stocks are selling for roughly 17 times their trailing earnings. While not cheap, these valuations are by no means excessive. The long-term average is roughly 16.5 times earnings. Unemployment is down, and U.S. Manufacturing levels are rising. Corporations are flush with money. Banks are in much better shape than they were in during the financial crisis a few years ago. Insiders are not dumping shares; they are actually stepping in and buying them. .
Our proprietary strength indicator has turned negative on the markets and this indicates that the lows will be tested again. The trend based on our Trend indicator has also turned neutral and V readings (our proprietary tool that measures market volatility) has soared to an all-time new high. Hence, we expect extreme moves to be the norm for the next few months. 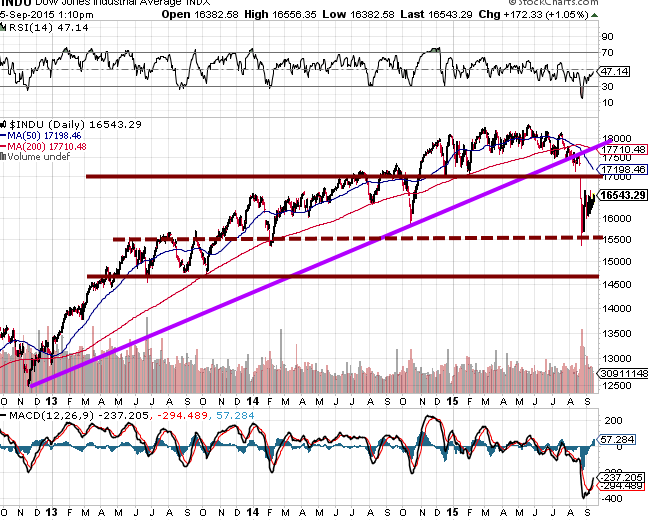 It would not surprise us if the Dow experiences a 1500-2000 point move over the span of one week. 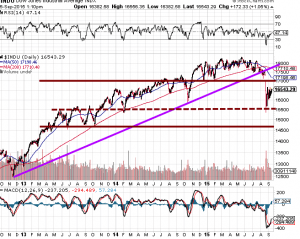 The Dow is having a remarkably hard time of trading above 17000, former support turned into resistance. After the selloff in August, a lot of technical indicators moved into the extremely oversold ranges. Thus, the corresponding rally should have been much stronger. Additionally our own indicators are not validating the current move up, which strongly hints that the lows will have to be tested again. If the Dow closes below 15500 on a weekly basis, then we expect the Dow to make a quick move down to the 14500-14700 ranges; if this were to occur, we could term it a screaming buy event. The housing sector is relatively strong. Purchase applications are up 18% year over year. It is interesting to note that the naysayers like clockwork start their chanting and howling specifically after the markets have started to correct; their screams are rather muted when the market is trending upwards. If you look at history, their record is rather dismal, as every so-called disaster and or end of the world scenario, these naysayers pandered about turned to be exactly the opposite of what they predicted. Instead, each of these so-called disaster scenarios proved to be nothing but splendid buying opportunities in disguise. Disasters will come and go. Depending on the lens you use to view such a situation, it can either represent a splendid opportunity or a monumental tragedy. History is replete with examples quite clearly illustrating that financial disasters usually make for splendid opportunities. We are not advocating that you run out and lunge into the markets; we have been stating for quite some time that the markets needed to let out some steam. Note, that the markets have not experienced significant correction since 2011. It would be folly to assume that the markets will trend in one direction without letting out a burst of steam. The markets have already shed roughly 15% from high to low. Given the heights they have run to since 2011, a 20% move would still be acceptable and nothing to fear. At this point, prudence is warranted, but a massive sell-off should be viewed as a buying opportunity, in contrast to a colossal tragedy. Our general suggestion would be to buy when panic sets in, and blood is flowing freely in the streets. Be wary when the masses are joyous and delighted when they are not.